Things are about to change drastically in my life. It’s a good change I believe, though I’m sure that there will be something of an adjustment period. The change I speak of is that my family and I are moving about 60 miles away due to a job promotion. The promotion is a good thing of course. We are leaving behind the farm house that we’ve called home for more than six years. I have mixed feelings about that. Up until a few months ago we hadn’t really given serious thought to leaving here but the situation has changed and we’re excited about the future and the possibilities that lie ahead. Though life will certainly be different. 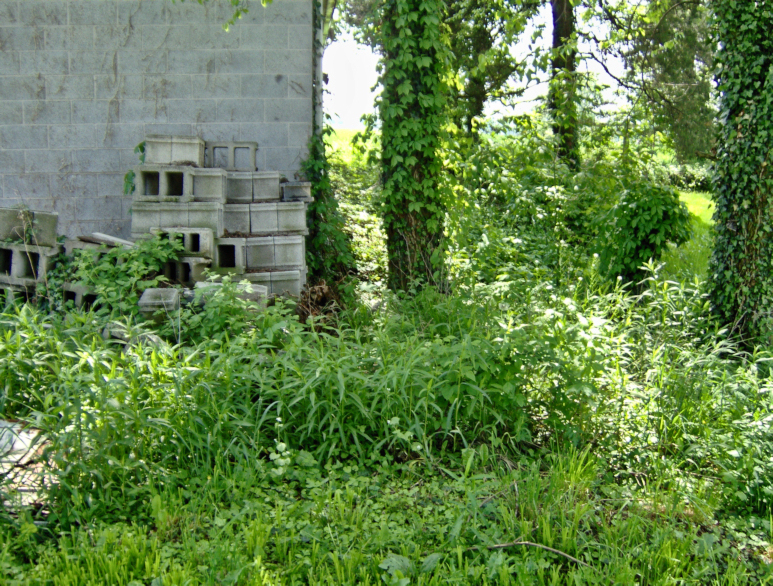 Though we are still searching for a new house at this time, we assumed early on that wherever we end up that it would be unlikely we’d be able to take the chickens with us. So we’ve already sold them. It was bittersweet seeing them go. I enjoyed having chickens these past couple years but I’m not gonna lie, the idea of not having animals at home to take care of is an attractive one, at least for now. I could see raising chickens again some day, but for the time being this is a serious blow to my not too seriously pursued pursuit of self-reliance. It’s also an opportunity to find new avenues to pursue some measure of self- reliance however. What exactly those may be I won’t know until we’ve found a house and I know what is possible there. Then of course there is the consideration of my music. It seems like I spend more time dealing with roadblocks to recording my songs than I do actually recording them. I really don’t know what to expect yet on this front since we haven’t found a house yet. Long term I think without animals at home that I will actually have more time to accomplish music. On a brighter note, I recently won an iPod Touch in a lyric contest and it seems that I may be able to use it as a little mobile studio which should be fun. That’s pretty much the summary of what is going on right now. In other news, my first book is getting published soon. I’ll have more details on that as the date draws nearer. I am a Musician and a Writer. It’s who I am. I work in retail management. It’s what I do for a living but it is not who I am. This is an important distinction that I need to keep clear in my mind at all times. For the sake of the well being of my family I pursue career advancement whether at my current employer or at another company. This is only because my current employer doesn’t pay me very much. I have no choice, I must try and seek greater financial gain for the sake of the long term security of my family. With that in mind, during the past couple years I have applied to countless job openings and only once have I even been called for an interview. I know that the job climate is tough but I didn’t know it was that tough to even get an interview. This makes me thankful that I am employed at all. I came to a realization tonight though. That all of that wasted time and energy directed towards trying to get a better job has gotten me nothing. Meanwhile I put very little time in to my writing and music. I’m not a great writer but I’m a decent one and will writing ever make me money? I don’t know but a sure way to not make money writing is to not write. Likewise, I’m not a great musician, but I’m a decent one and will music ever make me money? I don’t know but not making music is a sure way to not make money at it. I used to have a friend that felt that my focus with my creative pursuits had too much of an aim at making money with them. This friend didn’t have a family to take care of though. I don’t choose to focus on money with my creative work because I love money so much. I focus on the financial aspects of what I am doing because unless I treat my music and writing as a business that needs to be grown and nurtured, then it will whither and die and all that I will have left is half written books that no one will ever read and dozens of songs that no one will ever hear. I will write. I will make music. I will not give in to the “do nothing and be happy” mentality that seems to permeate society. There is a fire in me that will not burn out. At times I’ve maybe had to shelter that fire from the storms of life to ensure that it continues to burn, but it has never gone out. Each year when the calendar changes over I get an idea in my head of a theme for the year for myself. I don’t know what spawns the idea or why each theme is what it is, but it’s usually pretty accurate for the year that unfolds. In 2006, I got the idea that it was the year of Change. A few months later we found out that my wife was pregnant with our first child. In 2007 it was the year of Transition. A few weeks later I got a new job, after 5 and a half years at Staples. This year the idea that just popped into my head earlier is this: The Year of Breaking Free. I’ll explain more about what I think it means below but first I should catch everyone up on what’s been going on in my life. It’s been a little over four months since I posted something new, sorry about that, a lot has been going on in my life. Most notably of which is that my wife and I welcomed our daughter into the world a few months ago and that of course has kept me from blogging as much. A good thing of course. I’ve also continued to be quite busy with my web ventures which are progressing slowly towards more positive results. And I think I alluded to in the past that I had started a new band at the beginning of the summer. That band is 2 Hour Drive and we’ve been having a blast so far. So what does Breaking Free mean to me? Well in a few days I will turn 29 and for the past 10 years I’ve been working in retail. I don’t really like it, I never have. So in 2011, I hope to finally break free from that, whether that manifests itself as a job in a different career field or being self-employed with my web marketing projects. And speaking of which, Breaking Free also means breaking free from money problems. My job barely pays enough to put food on the table, with hard work and persistence I hope to increase revenue from internet marketing to finally get ahead of this money stuff. Breaking Free can also carry more ethereal meanings as well. Like breaking free from fear and apprehension, from worry, from wasting time. Free from burdens that only serve to demotivate me. This is my theme for 2011, what’s yours? It was a cold and windy day in early January when I got a call from my wife. “The sink is backed up and water is shooting everywhere out of the washer,” she said in a frustrated tone. Being the wise husband that I am I left work early to go home to my wife’s rescue. Upon my arrival at home an idea occurred to me that perhaps the problem was not that there was a clog but that the drainpipe exiting the house from the kitchen was frozen. This was entirely possible because the drainpipe was buried only a few inches beneath the ground. Old farmhouses have fun things like that. Before entering the house I circled around to the backyard and discovered the terrible truth. Water from a downspout had run downhill and washed dirt away from the pipe completely exposing a three inch section of it to the frigid air on the north side of our house. This was not a good situation. The sun was setting and the temperature was dropping even further and with a frozen drain pipe we wouldn’t be able to use any water in the house until it thawed out. Not really knowing what to do I drove to Lowe’s hoping to find some answers. An employee showed me to the electrical pipe heaters that are meant to keep a pipe from freezing. These ranged from $20-30 but clearly written on each one was a warning to only use it indoors and not allow it to touch the ground. I tried soliciting ideas from Lowe’s employees to try and fix my problem but they were unable to offer me any solutions. I was growing desperate at this point. It was dark out, cold, and windy. As I made my way towards the front of the store I spotted something that I thought just might work. It was a cardboard display of Hot Hands and Toasti Toes , the little bags of hand and feet warmers that people who work outside in the cold winter months sometime use. I read the packaging on each carefully. The Hot Hands actually get hotter than the Toasti Toes but the Toasti Toes don’t require oxygen to stay warm once you get them hot. For the idea that hatched in my head, there wasn’t going to be much oxygen available. I purchased six packs of Toasti Toes , costing me about $8. When I got home I quickly went to work. I knew that that main problem was that the pipe was exposed to the cold winter air, so I needed to cover it with something. With the ground frozen I had little choice: I went to the barn and got some fresh horse manure. It was readily available and well, some of it was still warm. Once I had removed the Toasti Toes from their packages and they got warm, I stuffed all 12 of them (there’s two in a pack) down around the pipe. Then I put a brick on top of it and dumped a wheelbarrow load of horse manure on top to seal in the heat. And then, I waited. And waited some more. Hours passed and nothing happened. I was starting to think that I had just wasted my time and that it was a stupid idea to think that a product meant to keep feet warm could possibly unfreeze a metal pipe in early January. It was late at night and I was about to get into bed, disappointed that my MacGyver-like home repair had failed and not knowing what I would do to fix it the next day. Suddenly, I heard a great whooshing sound coming from down stairs. My wife was already in bed and asked what I had done. “It worked!”, I exclaimed and ran downstairs to confirm what I knew to be true. Sure, enough the pipes were empty. The drain pipe was unfrozen all thanks to Toasti Toes ! Five hours, six packs of Toasti Toes , and a pile of horse manure were all that was needed to get me out of a bad situation. I have finished major construction on the chicken coop, which means that there are some smaller details that need completed but it’s finished enough for the chickens to move in. In case any of my readers are interested in building their own coop, I wanted to give a step by step of how I made mine. I figured on four square feet per bird which is a bit generous but I figured it would give me a little extra room if we ever wanted a few more birds. So I made the coop 4 ft x 8 ft but that what I didn’t think about was that that would be the outside dimension and the finished inside dimensions would be a bit less. Not a big deal though. This was the location we chose. It made the most sense as far as the trees and the adjacent building providing some shade in the summer time as well as serving as windbreaks in the winter. It was certainly not the easiest location to work with though. The first step was to put in a level foundation. This was probably one of the most frustrating aspects of the entire building process. Working with uneven ground, having to chop through tree roots and using a tiny little level was not fun at all. 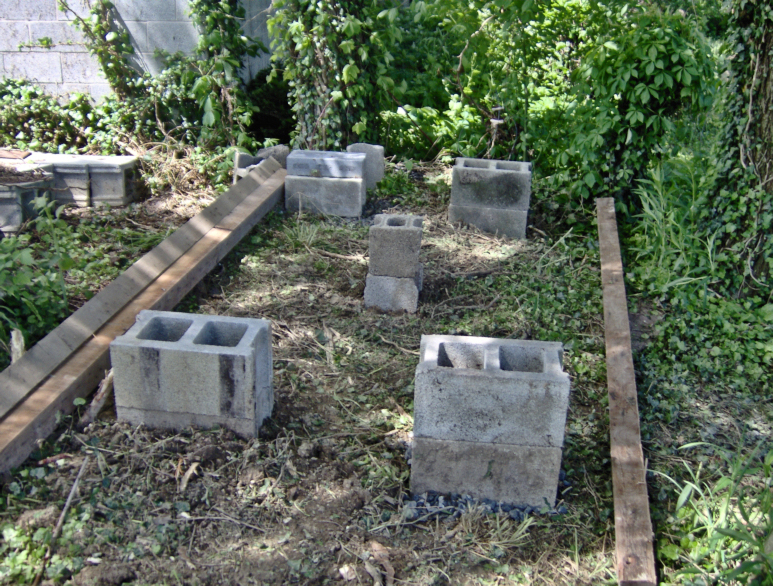 The blocks are not mortared together and not not concreted in the ground. 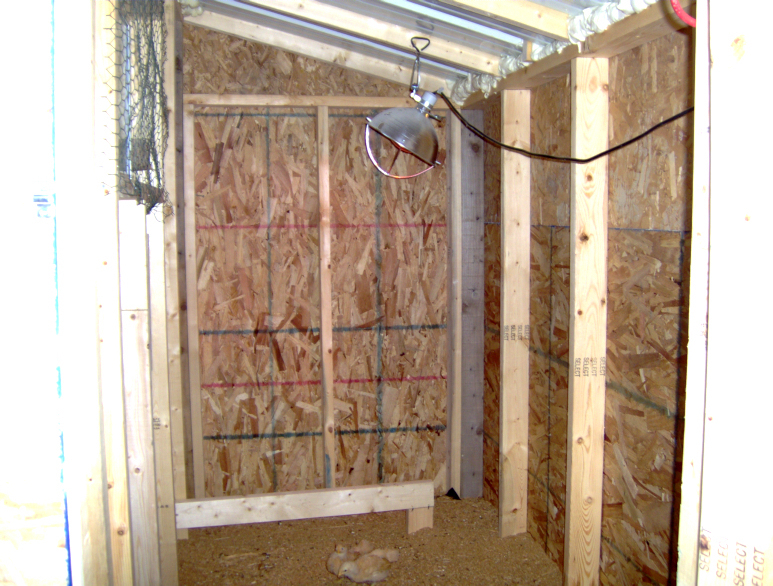 I wanted to be able to move the coop with relative ease should be decide on a different location at another time. Eventually I got all four corners mostly level, and came to a point where I said, “It’s just a chicken coop.” This phrase would be uttered many times as construction continued. 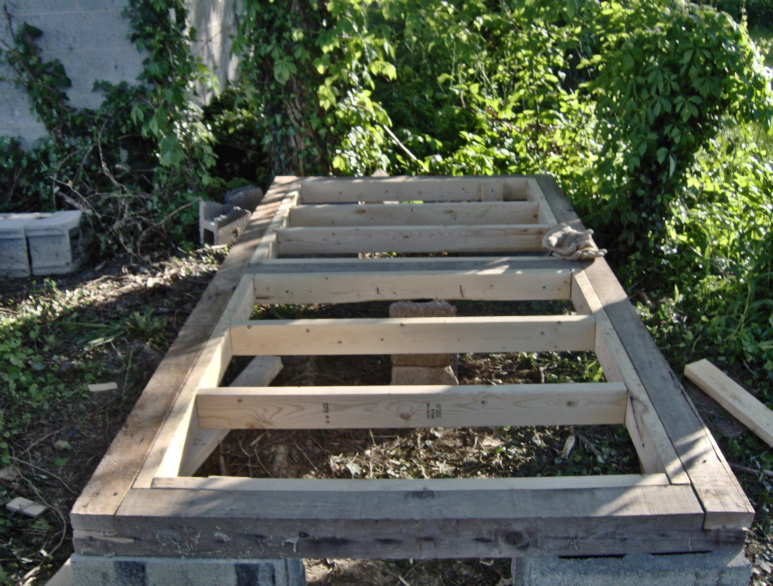 The floor was made up of 4 x 4’s around the outside edge and as a center support and 2 x 4’s in the interior. I cut the ends of the 4 x 4’s with 2 inch deep and four inch long grooves so that each piece would fit into the other. Not completely necessary but I think it adds a bit of strength to the building. Framing was relatively easy. The front wall is 6 ft high and the back wall is 5 ft high. The coop certainly didn’t need to be this tall but being able to walk inside of it should the need arise is going to be nice. The rafters are 6 ft long, so they stick out a foot in the front and back. This is for a little bit of weather protection. Had I thought of it I would have had the roof stick out a foot on each end as well. 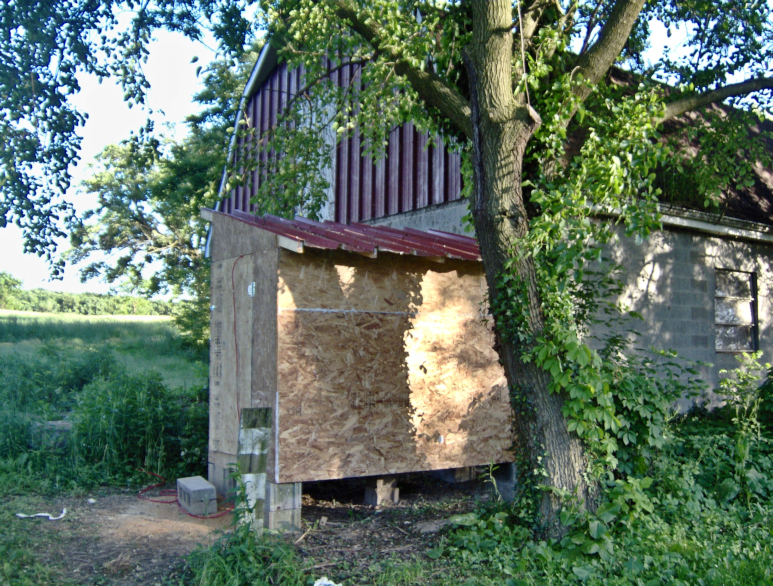 This is a view of the back of the mostly finished coop. Eventually there will be a hatch in the back that can be opened to reach in and get eggs from the nesting boxes. Eventually there will also be nesting boxes. The metal on the roof was leftover from 25 years ago when the metal was used for the sides of the adjacent building so it matches nicely. The window is slightly off center. 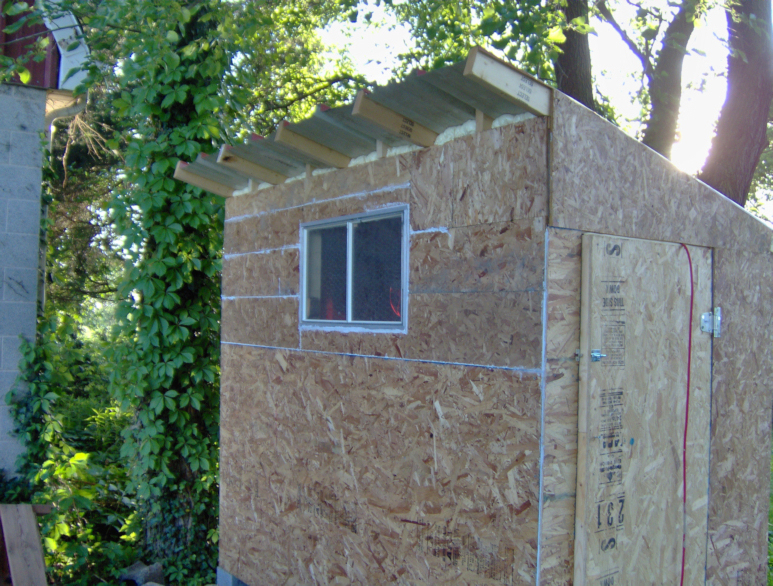 That is because we decided to use a different sized window after I had already framed the building and had to move a stud to accomodate the new window. 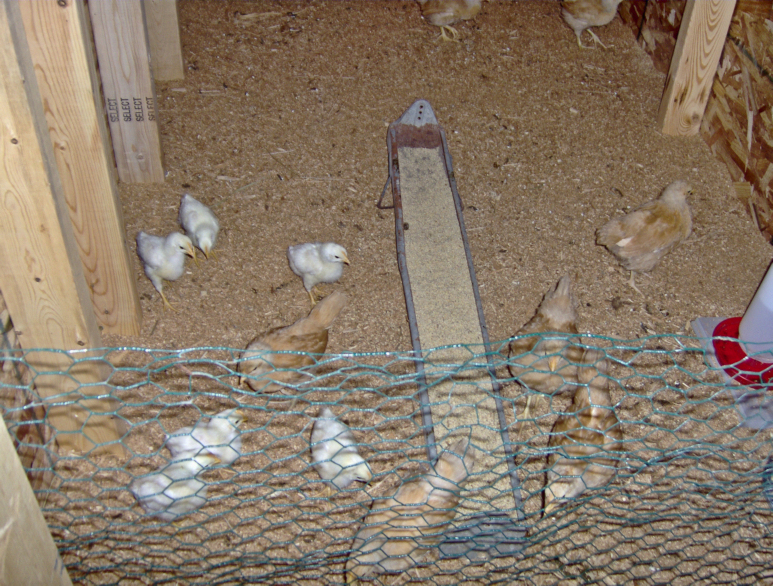 The smart thing to do would have been to move the studs on either side an equal amount, but it’s just a chicken coop. The nice thing about this window though is that it opens outward. The lines of white stuff on the walls is silicone caulk. As you can see I started using thin strips of aspenite on the wall as I started to run out of wood. Not all the cuts were completely tight so the silicone is to fill in the gaps. The foamy stuff up at the roof line is that stuff that’s meant to fill in small gaps in houses. I was at the end of my construction knowledge and didn’t know how to do soffit properly so we just filled in the holes with that stuff. The result is a bit ugly, but it’s just a chicken coop. This is the interior. I have a low temporary roost for our little chickens. Once they’re bigger I’ll build them something proper. I have chicken wire over the window on the inside to prevent escapees and to keep predators out. 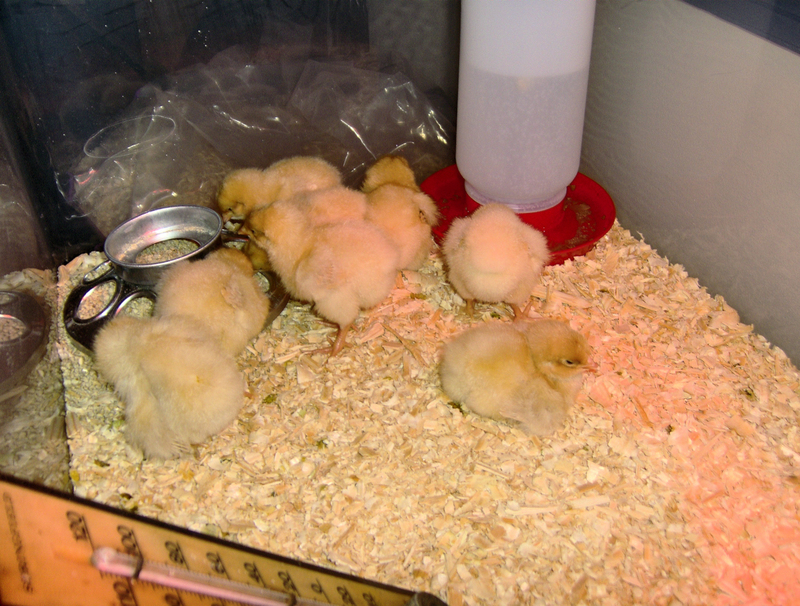 And there’s our chicks, complete with six little ones that were given to us. The large ones are our buff orpingtons, the little ones we don’t know what they are. I also put chicken wire in front of the door so they don’t run out when we are taking care of them. There you have it. That’s my chicken coop. It’s far from perfect but it was fairly cheap compared to some others I’ve seen and it was pretty easy to build. A coat of paint and a few things like roosts and nesting boxes and it will be complete. I hope this is helpful to others who are starting their chicken journeys. Don’t worry too much about perfection and try to keep in mind one thing: It’s just a chicken coop. I finally got my peeps yesterday, eight Buff Orpington chickens. They all appear to be healthy and are pretty fun to watch. Our son really likes watching them too. 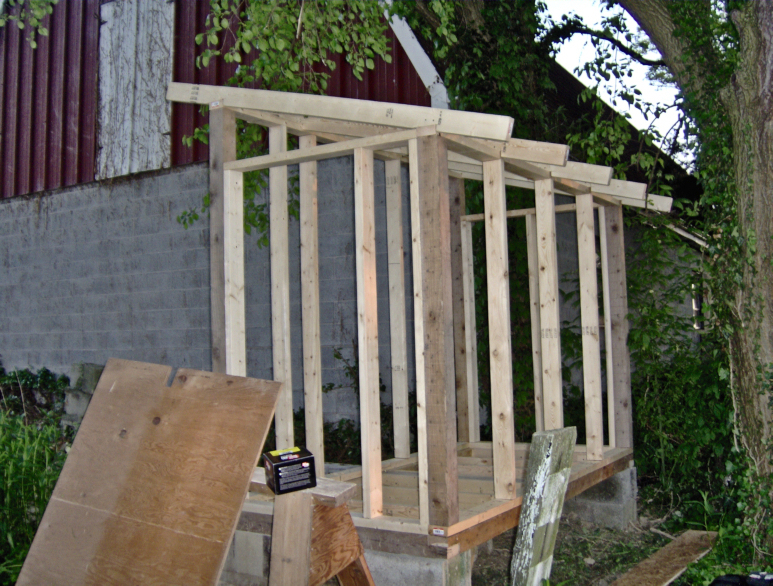 Now comes the hard part, I’ve actually got to build the coop. Once I get started on it, I will post pictures of the design and my progress. In other news we got the garden planted today. This is year number four of our attempts at gardening. I’m thinking that this one will be our most successful yet. And since every previous year has been a near disaster, it won’t take much for this year to be an improvement. It’s the time of year to start planning out the garden for the coming season and it’s been on my mind a lot lately. We’ve gone three years in a row with some fairly crummy gardening results and last season I was almost ready to give up entirely. But, a winter’s worth of tasteless grocery store fruits and vegetables has brought me back for another attempt. This year I actually plan to grow more than ever before so it should prove interesting to see how well I follow through with it. Last year we had attempted the gardening method called Lasagna Gardening. It was a spectacular failure but I think part of that was our fault. Over the winter I researched some other gardening methods and came to the conclusion that I don’t need any fancy gardening method. People have been growing stuff right in the ground for thousands of years and all it took was some hard work to keep the weeds out. And keeping the weeds out is always where we have faltered. So I’m looking for some tips and suggestions that any of my readers might have from their gardening experiences that might help me grow a successful garden this year. I’ve also been contemplating the question of what would I do if there really was a shortage in the food supply? Could we survive on what we grow? Right now the answer would be no, but I want to take a step in that direction. I am going to take one week this summer and not eat anything beyond what we have produced ourselves. There will be two exceptions to this idea. The first one will be fluids, though I will try and limit fluids to water, milk, and some juices. Nothing artificial at all. The other exception will be meat, though here again I will limit my intake during this week. We don’t produce our own meat so I can’t be too strict about that but again certainly no processed meats and I’ll probably come up with some preset amount of portions of meat that I will eat for the week. If our chickens are producing eggs by this point then the eggs will obviously be fair game. I really think it will fun and quite healthy to exclusively live off of what we grow. I haven’t picked an exact date yet, when I do I’ll post an update. So is anyone else willing to take the Grower’s Challenge with me? So for the past couple years I’ve been considering the idea of raising chickens. I thought it would be a great way to enjoy fresh eggs and meat. I would know where it came from and it would save me money and the food would likely be far better quality than what I can buy at the grocery store. During the past couple of weeks I started considering this more seriously and sought some advice on the matter. Some of the friendly people in the forums at Backyardchickens.com have been very helpful and have cleared up a couple of misconceptions that I had. It turns out that it’s fairly unlikely that raising my own chickens will save me money and could actually cost me more than store bought. My eggs will be cage-free organic eggs but I don’t spend the money on cage-free organic eggs from the store now so I can’t consider the cost of those kind of eggs. Even if I build a coop as cheaply as possible, the cost of grain will make up a good amount of the cost of the eggs I get. The eggs themselves won’t start coming until five or six months from the time I actually get the little chicks. There’s also the matter of butchering. I really don’t have the stomach for it and if I pay someone else to do it then I’m right back to where I started to it not being worth it financially. I also learned that most people butcher between eight and nine weeks which seemed awfully young to me but I’m certainly no expert. After learning all of this I was still on the fence about whether or not this was going to be a good thing to pursue. Then another tainted food recall appeared on the local evening news. It seems that this is happening several times a year now where we can’t trust the food that is being certified as safe to eat by the FDA. When I started to think about that and combined it with the massive inflation that many economists are expecting due to the government meddling in the economic system, I knew that I really didn’t have a choice anymore. I knew that even if financially it doesn’t work out better right away, that in a very short amount of time it could be a great investment and if safer, more nutritious food is the result then that is even better. So this Spring, I will most likely have some chickens and you will have a front row seat to all of my chicken escapades. My regular readers have seen me write about self-sufficiency in the past and it dawned on me the other day that if someone was self-sufficient then all of this stuff that is going on would barely even register in their lives. Take for example the Amish, they are certainly not 100% self-sufficient but they are probably about as close as anyone in America. You know, except for some crazy cults living in the mountains somewhere I suppose. I searched the internet for articles discussing the economic downturn and it’s affect on Amish communities. You know what I couldn’t find a single article. The reason that they are unaffected is because they don’t have mortgages, they don’t have money in the stock market, and they don’t have much use for oil. They grow their own food and make their own clothes. So there are lessons we can learn from the Amish. As I’ve discussed in the past, I am very inconsistent in my approach to self-sufficiency. The other day I had to come to terms with the reality that my house is not located somewhere where micro-hydroelectric was an option. Wind probably wouldn’t be very effective for me. And a solar system is well outside of my price range. But I also realized that I spend much more on food in a year than I do on electricity, we won’t even discuss how much I spend on heating oil in a year. Though we do grow a very small percentage of our food, if we were to increase that amount a good deal then we would gain a certain level of immunity to world economic issues. Food prices skyrocketing? Not a problem. Another tainted vegetable scare? That’s okay. Can’t afford the gas to drive to the grocery store? Hey no big deal, there’s food right outside the door. I have no delusions of ever being 100% self-sufficient but I can build myself a layer of protection from the world’s economic woes by taking steps in that direction. And you can too, maybe you don’t have the room to grow much food (although converting your yard into a garden would be a much better use of space) but perhaps you could generate your own electricity and know that even if you lose your job in all this mess, at least the lights will stay on. My perpetually inconsistent pursuit of self-sufficiency in regards to food yielded some mixed results this year. Our lasagna gardening was a spectacular failure. The idea of lasagna gardening is that you place a layer of cardboard over the area you want your garden to be and then layer compost, peat moss, manure, and whatever else would normally be used in a garden on top of it. This is supposed to smother the weeds or grass underneath and give you a rich growing medium for your plants. Well it was a rich growing medium alright, the weeds absolutely loved it. Really I think it was mainly our fault for not putting a thick enough layer on top to smother everything. But our plants did grow well too, just lost in the weeds sometimes. The onions we grew from seed did great but we harvested them too soon. The sugar snap peas were thriving until one day they completely disappeared. I think some baby rabbits got through our fence. Our peppers that we grew from seeds taken from store bought peppers didn’t really grow at all, we learned our lesson there. The cantelope didn’t produce anything. Our watermelon plants managed to produce one watermelon between them all which I accidentally lopped off with the weed whacker (which gives you an idea of how bad the weeds were). This was the third year for our strawberry patch and it was relatively weed free and yielded our biggest crop yet but even so the amount of berries we got was pretty pitiful for the amount of plants we have. This was also the third year for our grape vines and still they produced no grapes. They grew a good deal but I’m not sure what to do if they still don’t produce next year. It was the second year for our self-pollinating peach tree. Seventeen peaches grew on it, none of which developed into anything edible. It was also the second year for our two apple trees. One of which seemed to have died over the winter but just the other day I saw that it had begun regrowing from the base and now has a new “trunk” that is a couple feet tall so hopefully it will make it through the winter. Our raspberry crop was large as always though perhaps not quite as plentiful as last year. Three years into all these gardening attempts has started to be a bit of a downer. Each year it seems something comes up that keeps us from putting the time into maintaining the garden like it ought to be. Two years ago my wife and I were each working full time jobs. Last year we had a new baby. This year I sprained my ankle and was out of commission for awhile. There was one bright spot for the garden this year though. Our tomatoes came in wonderfully. We had tried doing tomatoes in hanging baskets which failed miserably because the soil would dry out very quickly if we didn’t watter them every day, which we didn’t. But the tomato plants that we put in the garden produced a large crop in spite of not being supported on anything and being smothered in weeds. The tomatoes and a few other vegetables from the store allowed us to make enough salsa to last a year. Before we harvested them and made the salsa I was ready to throw in the towel on gardening all together. Three years of failed efforts were piling up in my brain but the tomatoes helped place me firmly back on the course of self-sufficiency.